Congratulations, Michele! 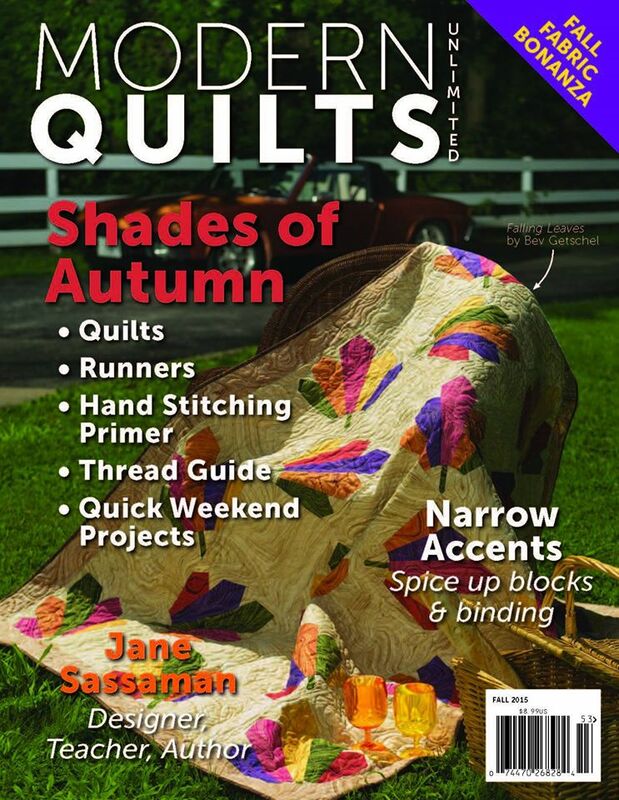 You will receive your own copy of Quiltmaker's 100 Blocks, Volume 12. Michele was chosen by "ye olde" random number generator. Michele's comment to the question, "What is your favorite tradional quilt block?" was answered, "A log cabin quilt was the first quilt I made and I still love the block. Cute flowers..."
If you are curious, Log Cabin was the most popular answer to my question, and many of you, like Michele, stated it was the first quilt block you learned to sew. If you would like to purchase a copy of Quiltmaker's 100 Blocks, Volume 12, I have it for sale in my shop here: Curlicue Creations Shop. Hello! 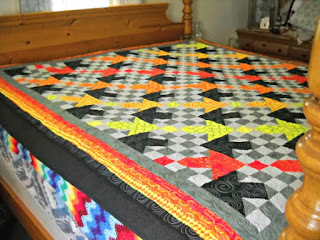 Welcome to my little segment of Quiltmaker's 100 Blocks, Volume 12 Blog Tour. I'm so glad you're here, visiting my blog home. If I could, I'd offer you a warm cup of cocoa and a cookie. This is my block for the issue, Pinwheel Flowers. It appears on page 37 of the magazine, Block #1160. At the end of my post I'll give you a chance to win your very own copy of Volume 12. Let's talk a bit about backgrounds and using directional fabrics today. For the Pinwheel Flowers block, I used a cloud print fabric. As I cut out the pieces for the background, I made sure all my clouds were "floating" in the same direction. You can see here that they don't have to fit together exactly at the seams to get a good sky effect. 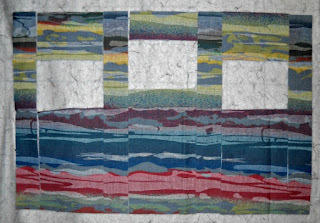 I played with the block's background in this version, using a "sunrise/sunset" style fabric. All these pieces were cut from one fat quarter. I laid the pieces out on a design wall as I cut them to keep them in order. It only takes a little bit of planning to use directional fabrics effectively, and they can add fun and fabulous dimension to your blocks. 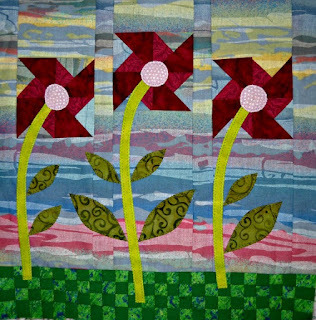 This is the completed sunrise/sunset version of the Pinwheel Flowers block. You can easily change the mood of this block by simply using different background fabrics. Pinwheel Flowers seem to glow at night with this dramatic dark blue version. 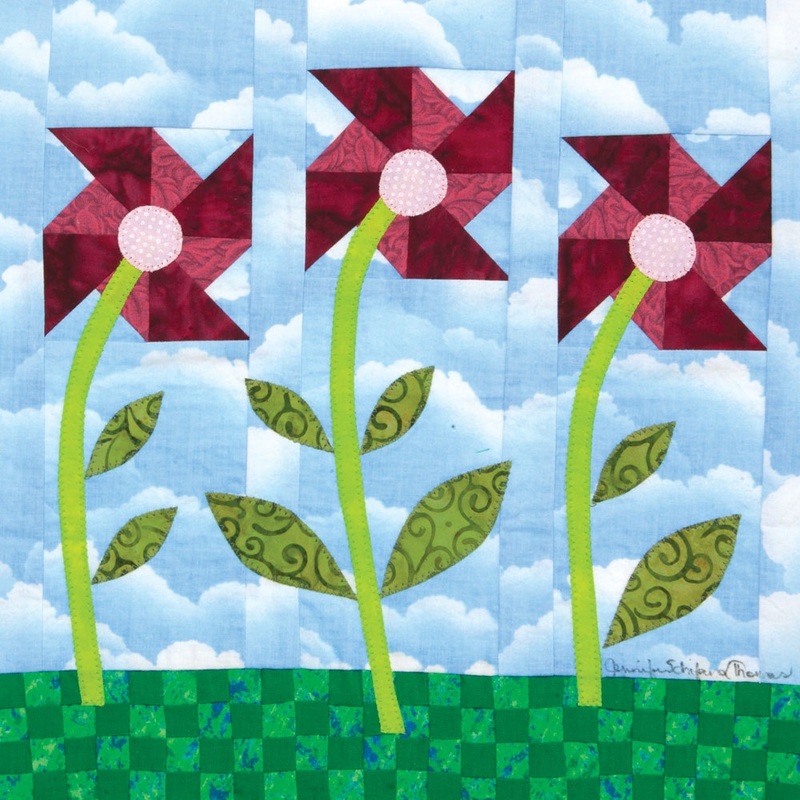 Pinwheel Flowers on a sunny day can be sewn by using a light yellow fabric for the background. What a happy feeling the yellow background creates. In this version I made the flowers three different colors. Notice how I kept the light, medium, and dark values the same in each flower. This is a great way to use a variety of colors and still have a balanced look. What can you do with the Pinwheel Flowers block? 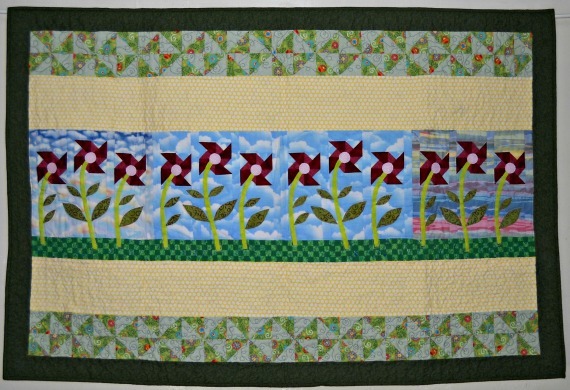 You can sew a few together and grow a garden of flowers - or a whole field of flowers. 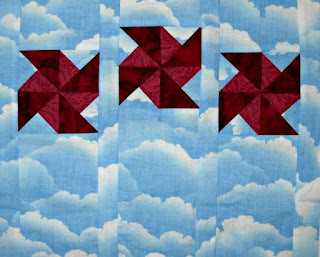 I sewed a strip of four Pinwheel Flowers blocks together, and combined them with a few more strips of fabric, and pieced pinwheel strips to make this happy wall hanging. It's hanging in my studio today, right over my quilting machine. 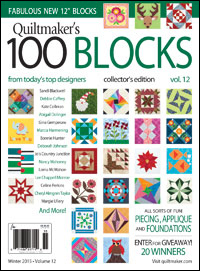 If you haven't already seen it, here's the cover of Quiltmaker's 100 Blocks, Volume 12. Pinwheel Flowers actually made the cover, along with so many other fabulous blocks - awesome! Thank you, Quiltmaker. 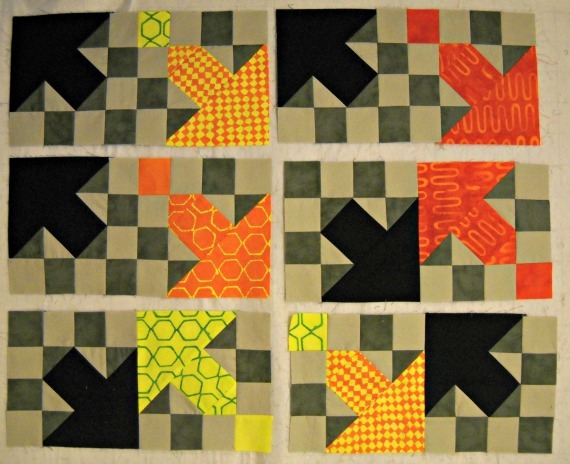 To win your very own copy of Quiltmaker's 100 Blocks, leave a comment below. 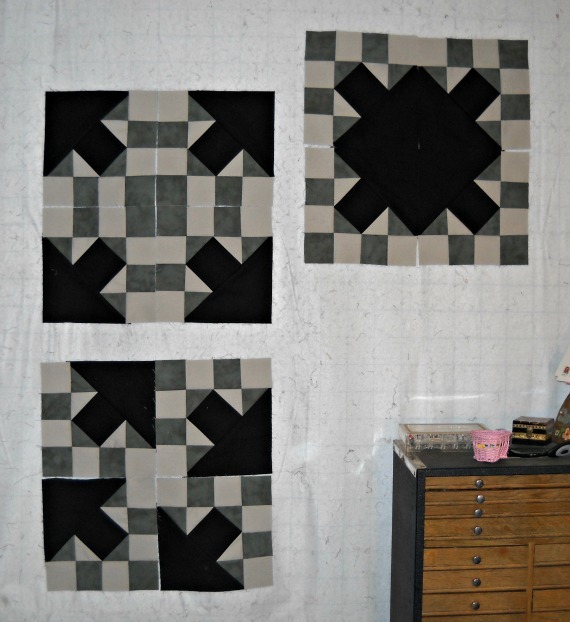 Let's make it interesting, please comment about your favorite traditional quilt block. Be sure I have a way to contact you, should you be the lucky one. Thank you so much for stopping by. 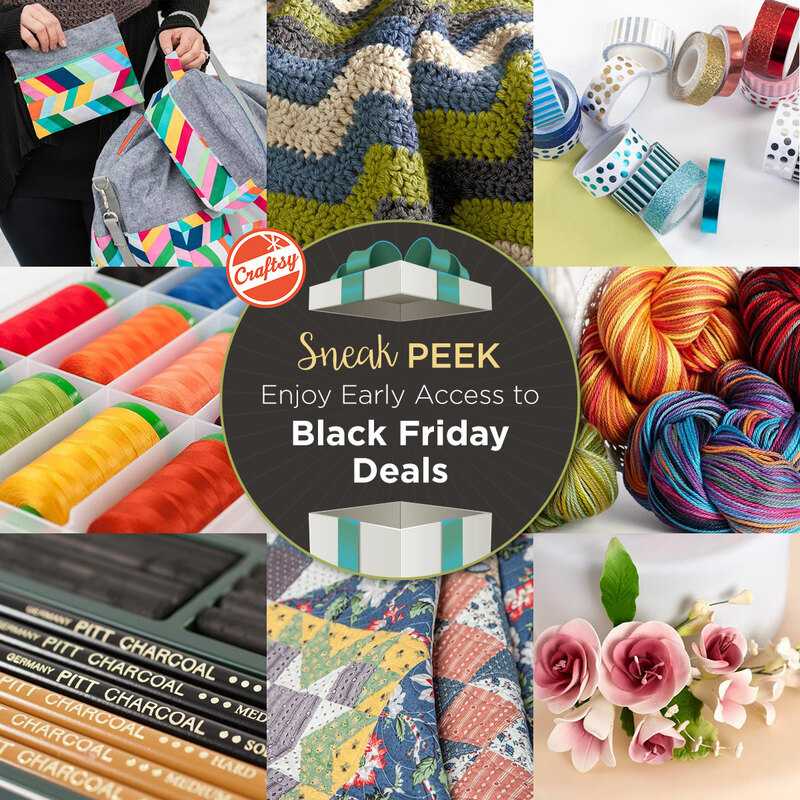 Be sure to visit the other designers on the tour all week - you can return to the list at Quiltmaker's blog here: Quilty Pleasures. 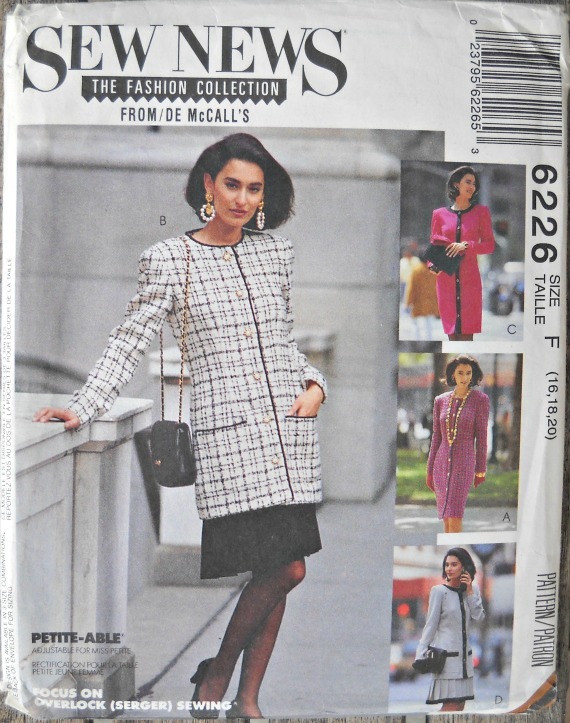 McCall's 7356 Dress Pattern, sizes 10 and 12. This pretty pattern makes a carefree pullover dress in two variations. "Make it tonight - wear it tomorrow". Dress features short flared sleeves, boat neckline, back button at neck, elastic waistline and side seam pockets. Dress can be sewn in two lengths. The long length has a left side slit. This pattern is in factory folded, uncut condition. The envelope is a little worn from age. All directions and pieces are included and in very good condition. 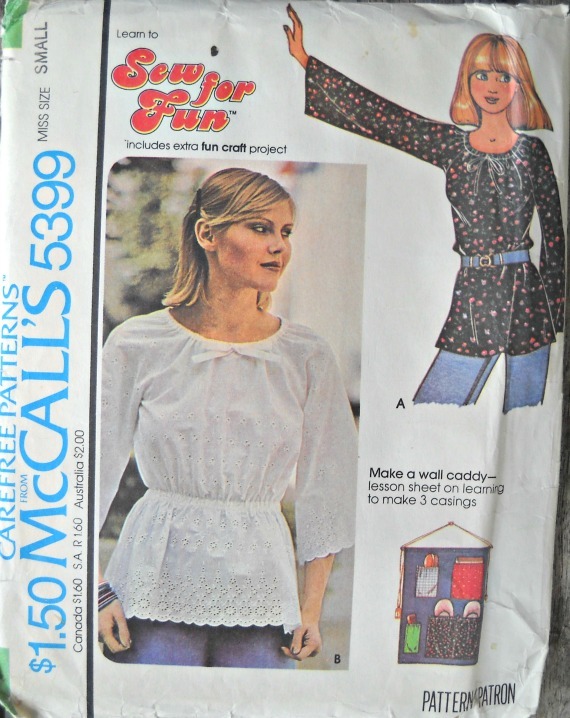 This pattern is vintage 1980, and truly a timeless design. Picture yourself wearing th1s fabulous dress to the office, on a dinner date, or just out shopping. 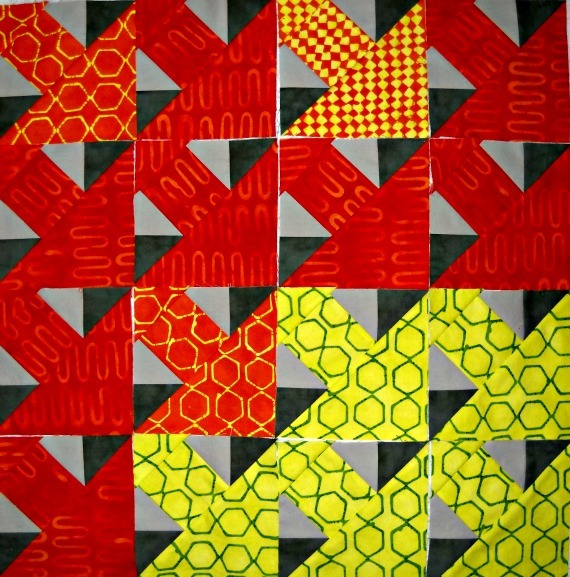 This pattern will inspire you to be confident, plus, you can say you made it yourself! 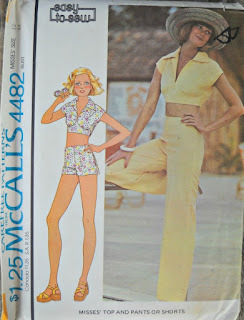 McCall's 4482 Top, Pants, and Shorts Pattern, size 12. This pretty pattern makes a carefree cropped top outfit with either pants or shorts. Mix and match for more fun! Top has extended shoulder line, collar, cropped midriff length, and lower back elastic casing. Pants and shorts have back zipper closure. 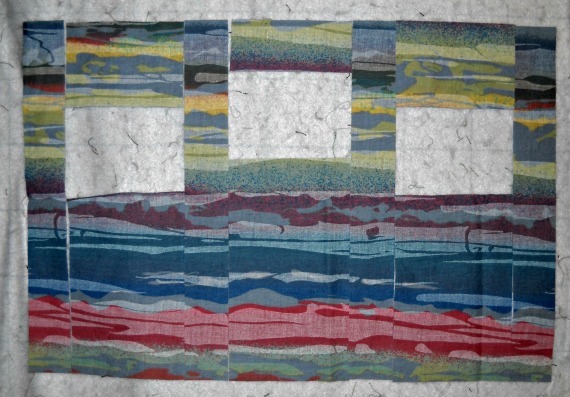 This pattern is in factory folded, uncut condition. The envelope is a little worn from age. All directions and pieces are included and in very good condition. 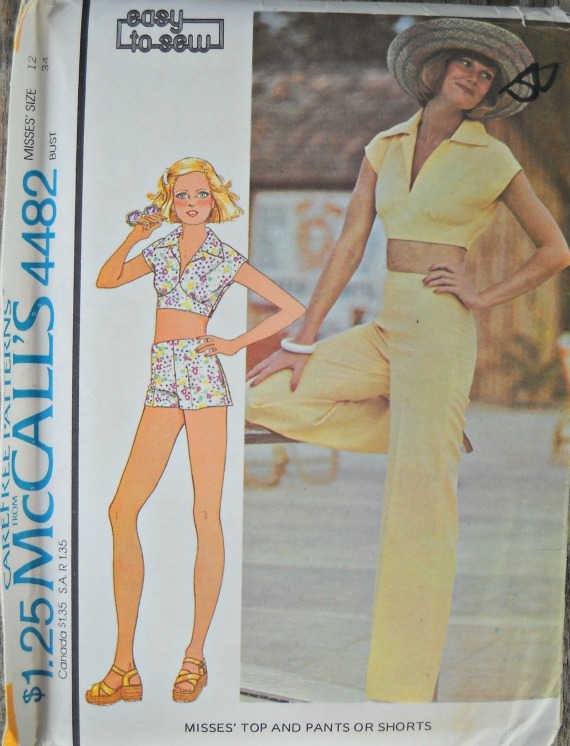 This pattern is vintage 1975, and truly a timeless design. Picture yourself wearing th1s fabulous outfit to the beach, on a picnic, or just out shopping. 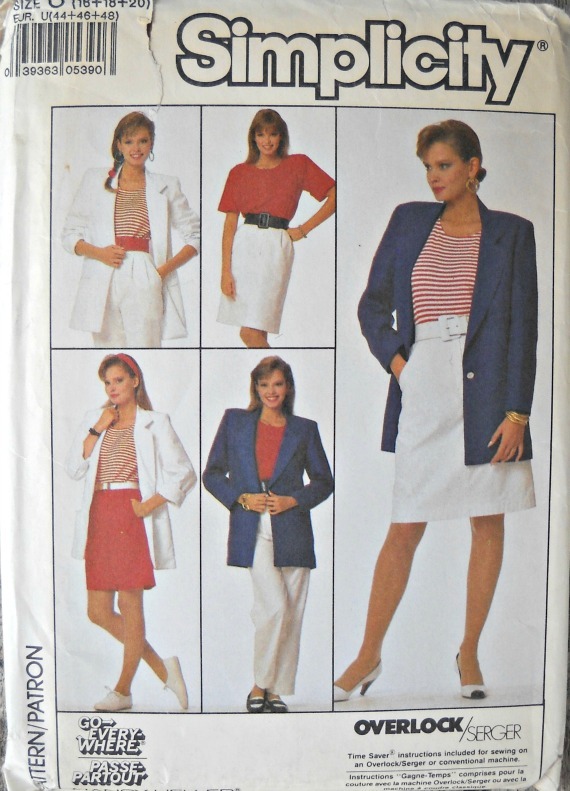 This pattern will inspire you to be confident, plus, you can say you made it yourself! Simplicity Cinderella 9610 Child's Back-Button Dress Pattern, size 4. 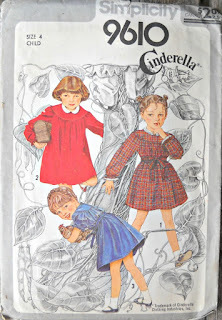 This pretty pattern makes a children's smock style dress in three variations. All views are gathered to a shaped yoke, feature Peter Pan style collar, raglan sleeves with self ruffles. Options include elastic casing waistline, self carriers with tie belt, short or long sleeve length, eyelet collar and sleeve edging, and contrasting collar. Picture your favorite little girl wearing th1s fabulous dress for a special occasion, to church, or a playdate. 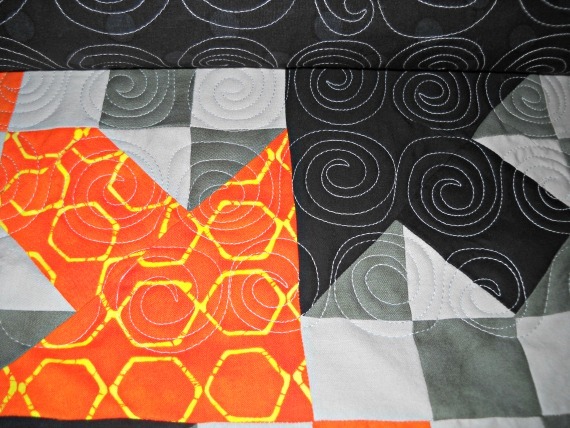 This pattern will inspire her to be confident, plus, you can say you made it yourself! 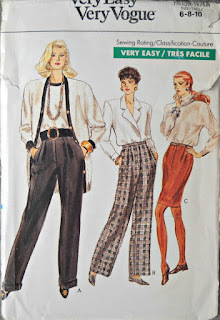 Very Easy Very Vogue Pants and Skirt Pattern, sizes 6, 8, and 10. This pretty pattern makes pants in two variations, plus a skirt. Pants are straight-legged, skirt is tapered above mid-knee length. Both feature waistband with carriers, front pleats, side seams and mock zipper. Both pants views have pockets. Cuffs are optional. This pattern is in factory folded, uncut condition. The envelope is a little worn from age. All directions and pieces are included and in very good condition. 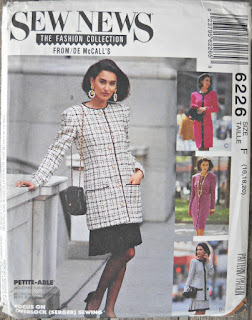 This pattern is vintage 1988, and truly a timeless design. Picture yourself wearing these fabulous wardrobe essentials to the office, dinner and a movie, or even just out shopping. This pattern will inspire you to be confident, plus, you can say you made it yourself! 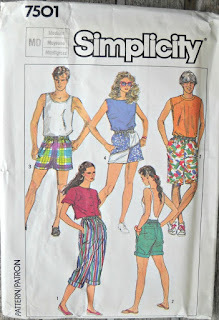 Simplicity Pants, Shorts, Skirt, Unlined Jacket, and Top Pattern, sizes 16, 18, and 20. 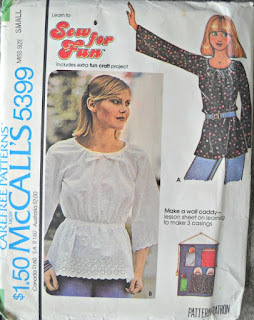 This pretty wardrobe pattern makes an amazing variety of clothing combinations for you to sew and enjoy. Top is suitable for stretch knit fabrics only and features extended padded shoulders and ribbon bow detail. Jacket features button closure, notched collar, buttonhole pockets and two piece sleeves. 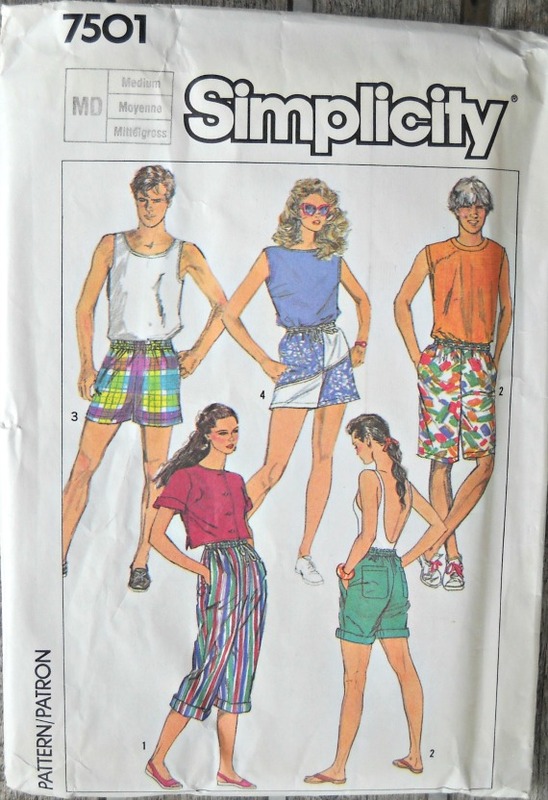 Pants, shorts, and skirt have front pleats, elastic waistbands, front pockets, and fly zipper. Note: Time Saver instructions are included for optionally sewing on an overlock or serger machine. Picture yourself wearing this fabulous ensemble to the office, dinner and a movie, or even just out shopping. 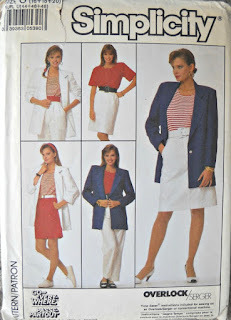 This mix and match outfit pattern will inspire you to be confident, plus, you can say you made it yourself! 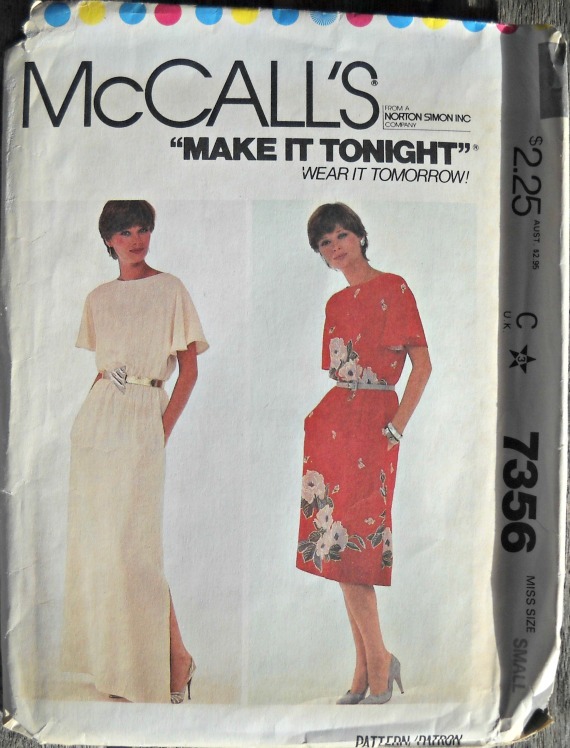 McCall's Dress with Tie Belt Pattern, size 12. 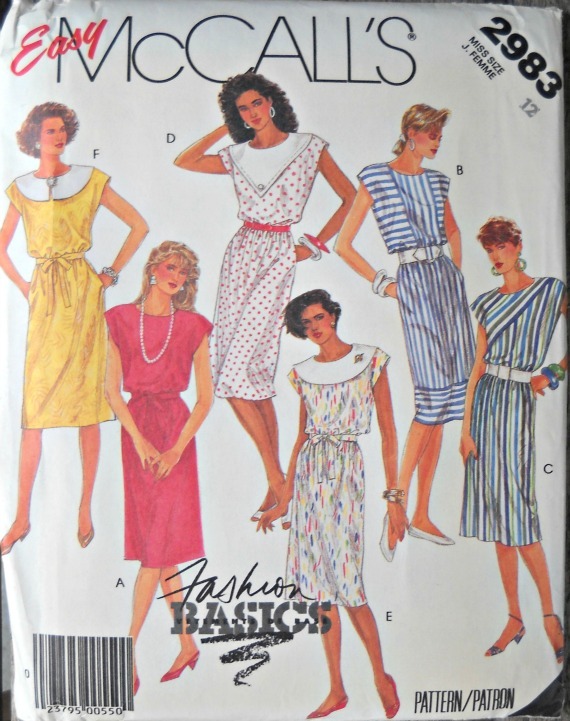 This pretty pattern makes a dress with tie belt in six versions. All dresses feature pull-over styling, elastic waistline, extended shoulders with shoulder pads, back neck opening with button and loop closure, side seam pockets, and fabric tie belt. Options include button trim and contrasting collars. This pattern is in factory folded, uncut condition. The envelope is a little worn from age. All directions and pieces are included and in very good condition. This pattern is vintage 1987, and truly a timeless design. Picture yourself wearing this romantic dress to a picnic, dinner and a movie, or even just out shopping. This dress will inspire you to be confident, plus, you can say you made it yourself! For these and more timeless patterns, please visit the Curlicue Creations Shop. 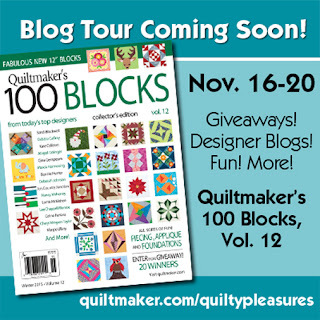 Join me for the Quiltmaker's 100 Blocks, Volume 12 Blog Tour on November 16th! Just a quick post today - I wanted to share this vintage-y pincushion I found at the local thrift shop. I still need to clean it up; maybe I'll share an "after" picture, too. Isn't it cute? It's about the size of my fist. The tiny ruler is my favorite part. 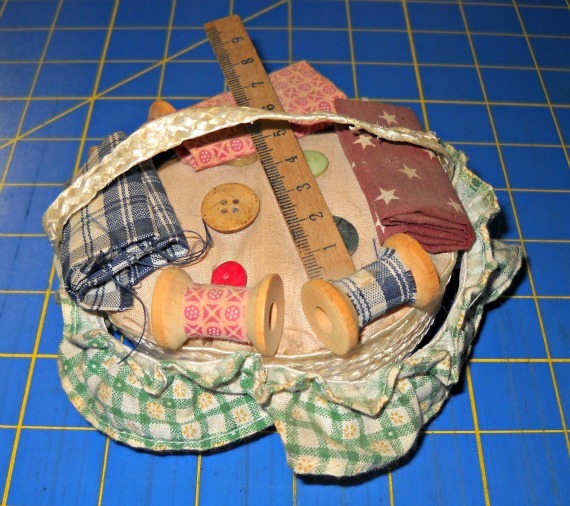 Ruler, buttons, wooden thread spools, tiny bits of folded fabric, all tucked inside a little basket. So cute & this would be a fun, easy, and thrifty gift to make for all of your quilting friends. 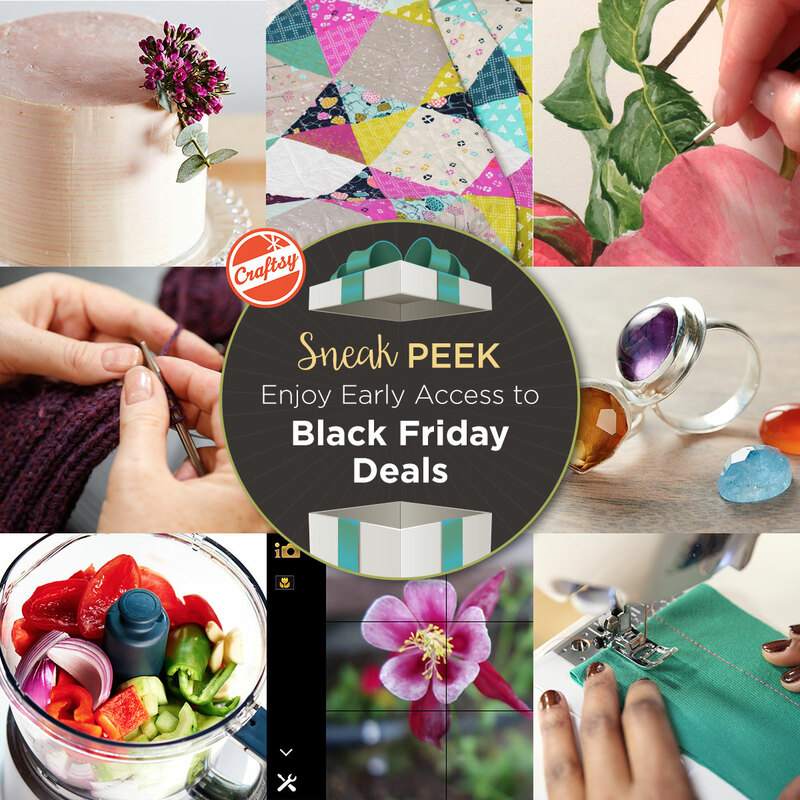 Do you have any quick to sew gift ideas? Please share in the comment section below. 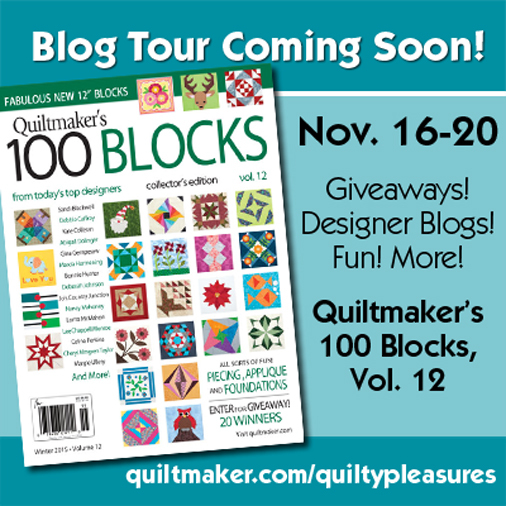 Don't forget to join me on November 16th for the Quiltmaker's 100 Blocks, Volume 12 Blog Tour. That's one week from tomorrow - how exciting! Mark your calendar. I'll see you then. The Complete Idiot's Guide to Knitting and Crocheting Book. 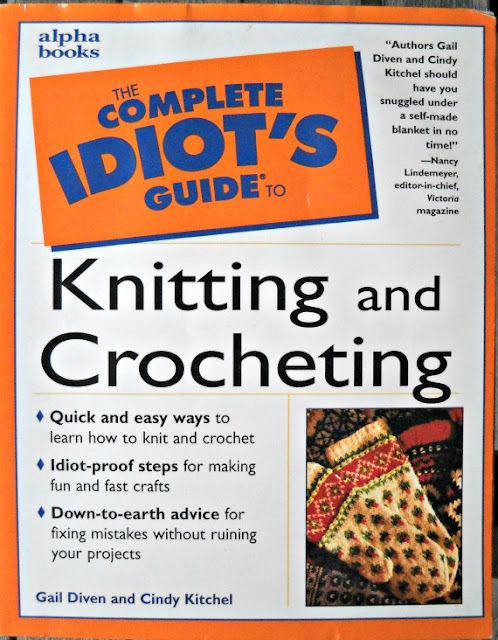 This knitting and crocheting how-to book has a panorama of knitting and crocheting basics plus advanced techniques. This book is divided into different sections, including Begin at the Beginning, Knitting Basics, Taking the Next Step: More Complex Knitting, Crochet Basics, and Final Helps. This book also includes a resource guide and a glossary. 284 pages. Copyright 1999. Softcover. The book is in fair condition. 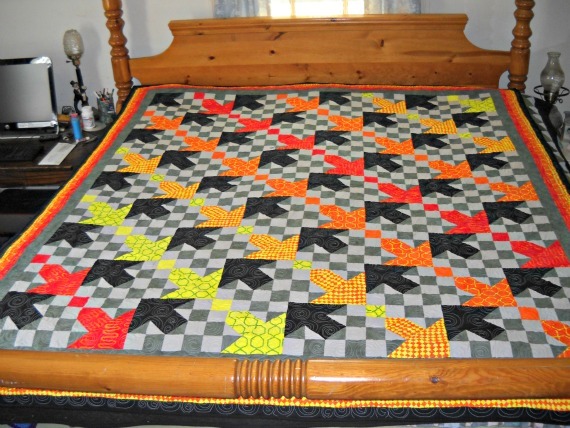 Reminder: Join me for the Quiltmaker's 100 Blocks, Volume 12 Blog tour on November 16th!